Caddisflies - If you fly fish for trout in the West, could Gary LaFontaine's classic work be the most important bug book written? Read the review in Entomology. Splitting Cane surveys contemporary bamboo rodbuilders but failed to inspire this reader. Read the review in Bamboo. Many Rivers to Cross combines some of the best travel documentary along with the author's keen understanding of the issues facing native trout in the Western United States. Read the review in Native Trout. The Trout and the Fly transports you to the world of the freshwater trout - where he lies, how he sees, what he sees and what the angler can do to improve his chances in catching these fish. The Angler's Bamboo visits the region of China where all the Tonkin bamboo is grown and harvested - eventually transformed by the master rod-builder into something anglers will spend thousands of dollars on and countless hours with. Read the review in Bamboo. Fly-Fishing for Sharks is a state of the union report by Richard Louv on all things angling. Reviewed in Fly Fishing. Read the entire review in Native Trout. Read the entire review in Destinations. 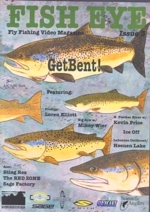 Get Bent offers plenty of rod bending material - translation: lots of big, juicy trout. The jazz track accompanying this section almost keeps pace with the video action on screen. This opening moves with rhythm and energy. A video mosaic of rivers I recognized like the East Fork of the Carson, the Truckee (appears to be footage from Fish Eye #2) with some of the usual faces which Mikey has fished with - including an eight year who takes a rainbow on a dry fly. It wraps up with another youngster Loren Elliott hooking and landing a 20 inch rainbow on the East Fork of the Carson. 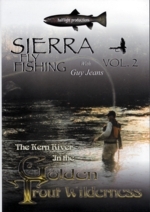 Read the entire review in Fly Fishing. My Story as Told by Water covers a varied terrain ranging from environmental activism to the virtues of fly-fishing without a hired guide. The book is really a collection of essays (many published in other books and periodicals) about rivers in the Northwestern United States. Duncan shares much of his early life growing up in neighborhoods just beyond the growing tentacles of Portland, Oregon. He writes openly about this family, including his bitter confrontation over the war in Vietnam with his dad, and the loss of his brother. Given such a backdrop, it's easy to understand how Duncan turned to the solitude of fishing local streams to deal with the pain of his youth. 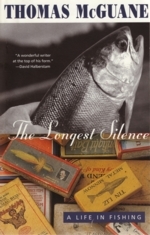 Later in the book, Duncan finds his stride writing about the not-so-bright outlook facing wild salmon along the Columbia and Snake Rivers. You can almost feel the tears welling up in his eyes as he describes their near exit from his world. He sums up the disaster of the salmon run on the Snake River this way: "The babble of 'salmon management' rhetoric has taken a river of prayful human yearning, diverted it into a thousand word-filled ditches, and run it over alkali. When migratory creatures are prevented from migrating, they are no longer migratory creatures: they're kidnap victims. The name of the living vessel in which wild salmon evolved and still thrive is not 'fish bypass system,' 'smolt-deflecting diversionary strobe light,' or 'barge.' It is River." Duncan opens his heart to the connections he has to rivers and wild fish. But more importantly, he gives us inspiration for making our own connections to those wild places. The author invites you to come along on a rafting / fly fishing trip down Alaska's Kanektok River. There's excitement in the air in the opening chapter as the author and his teenage son hop planes from Philly to Anchorage then to Dillingham and finally dropped by bush-plane into the Alaskan wilderness - ON THEIR OWN. To dial up the adventure meter here, the East coast duo decides to cover the 100 plus mile float by themselves. Add to that a shoe-string budget for equipment and a first time ever trip to the wilds of Alaska, and well, I sensed it would be interesting. The video magazine opens with a twisted tribute to the opening scene in the movie Jaws... instead of a young, female swimming substitue a mayfly. Watch the serenity of a mayfly floating carefree. Then witness the death from below reality when a trout goes on the feed.